The creatives are celebrating themselves in France this week, and mobile is sure to have a substantial presence among the winners at this year’s Cannes Lions International Festival of Creativity. But when agencies aren’t winning awards for their standout programs, they have to go about the everyday business of making these diminutive platforms engaging for hundreds of campaigns every year. And so the IAB this week issued a “Mobile Manifesto” of best practices around mobile creative executions called from interviews with senior-level creative executives from the major agencies as well as judges for both the Cannes and IAB MIXX awards. The four key best practices are not surprising, but still instructive. 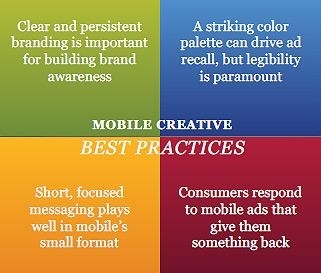 In general, the agencies surveyed recommended that mobile campaigns ensure that a marketer's brand is clear and persistent, that the design use a striking palette to drive recall, that messaging be short and tight, and that marketers cultivate user response by offering them something of value in return. When it comes to branding, most of those surveyed felt that a full logo with the brand name should be at the corner of every page in an execution. While some creatives disagreed, most felt that the diminutive nature of mobile advertising required constant visibility of a brand. Likewise, most felt that one or at most two bright colors that allow for high legibility of messaging is critical to design. The color schemes of off-line and desktop display advertising often will not work within the compact mobile screen and still leave the lettering clear, some warned. And once that message can be read, marketers need to make sure that the text is concise and simple enough to be grasped quickly. Using short, provocative messaging that communicates a key idea and does not fill up more than half of the creative real estate seems to be the rule of thumb. And when it comes to generating responses from users, most of those surveyed agreed that the personal nature of the mobile device demands clear offers of value to the consumer within the creative. Value can be something more than just an offer or discount, however. Entertaining and amusing the user also can be seen as giving something back in exchange for their time and attention. Overall, the creative noted the increased emphasis on content in marketing as well as the ways in which mobile changes our notion of context. Since users dislike interruption most on their mobile devices, agencies are looking for ways to get their brands’ messages into the flow of content consumption more effectively. But most of all, mobile is changing the traditional notion of context and marketing. Rather than referring to an ad's adjacency with specific kinds of content experiences, context now refers to a broader range of user states. Context now refers to not only where the user is engaging a message physically, but also what mode they are in and what the user may be thinking or needing at any given moment or in any given place. In contemplating the future of mobile marketing, many of those surveyed are understandably excited about the possibilities for location-based technologies to inform advertising creative. Many are looking at the ways in which devices can personalize the brick-and-mortar shopping experience. Others are interested in how location profiling and geofencing can make the message more contextually aware. The complete “Mobile Manifesto” including recent mobile ad impact research from Dynamic Logic is available at the IAB site.